If you have decided to sell your house in Los Angeles, you might find the process to be a bit cumbersome. the good news is that it doesn’t have to be! 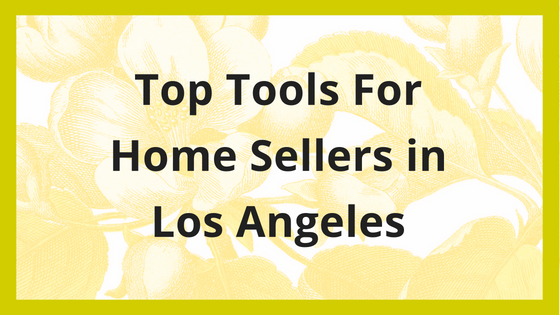 In this most recent post, we will explore some of the best strategies and top tools for home sellers in Los Angeles. Think virtually. Here’s one of the best top tools for home sellers. We all live on visuals. First of all, photos are great for showing off your home and an absolute “must” when it comes to listing your house properly. What’s even better in this day and age? Virtual tours! People love being able to get a feel for the home before viewing it in person. There are many apps and software programs out there that can help you create a virtual tour of your property on your own. You can also choose to hire professional videographers to showcase your property, making it stand out from the rest. Some companies are even incorporating the use of drone technology to create a “fly-thru” of a property that will make the property look sharp and sophisticated. Even if you are just simply sticking with photos to show the property in online listings, make sure the photos are of the highest quality. This is one place where working with a professional will definitely pay off! A good photographer of real estate will know exactly what sells and what doesn’t. Remember, you get one shot at making a great first impression and these days that is online with photos and video. What’s the cost for this? I have seen anywhere from $250 for photos only to $500 for both photos and video. Drone video is extra but can be well worth it if you have a great neighborhood that has a feature that you’d like to show-off. One selling solution that more and more people are utilizing is to work with buyers directly, without having to pay the fees and commissions of an agent, nor having to wait through the typical listing time of 3 to 6 months. There are knowledgeable and trustworthy companies such as The Shenbaum Group, Inc. that will make selling a Los Angeles fast, profitable and simple. Working with a direct buyer will typically mean you will receive a much faster closing, without any of the costs of a traditional listing. There are no repairs, marketing costs, listing fees, commissions or closing costs that you have to pay! You will typically be able to sell the house in only a few days, not weeks or months as with a traditional sale. The most important thing to remember is that not all buyers are the same. So make sure you do your homework before selling your house to a direct buyer in Los Angeles County. For many properties, hiring a professional stager can really make a difference. They will typically have a design background, impeccable taste and a vast knowledge of what is working right now. They know what items will subconsciously draw people into the home and what elements to absolutely avoid. Home staging can be a bit expensive, but you can choose to do just a couple rooms if you need to save on the out-of-pocket costs. If you are still living in the home, your personal belongings will need to be packed up and stored away. This can give you an advantage when moving day finally comes, too. It can be a win-win, for sure. Ultimately, though, staging will give you a huge gain over your competition and that’s why it’s one of the top tools for home sellers. We stage every single house we sell, it’s that important to the overall sales plan. What’s staging going to cost you? Anywhere from $3,000 to $10,000 depending on the number of rooms that you want to stage. Often times people have an emotional attachment to the house which increases the value but only in their minds. Take a look at what other comparable houses are selling for and see how they compare to the price you have in mind for your house. Take a look at multiple valuation tools, and determine an average value for your house. Think Redfin, Zillow and the Zestimate, and Trulia. If selling your house directly, take into account the amount you are saving on repairs and commissions by taking the agent out of the equation. Most direct home sales are done “as-is,” which means no repairs required and therefore no headaches. People love a well-designed home. There are all sorts of software programs and apps that will help you show off what the interior of the house can look like when it’s remodeled. You can create multiple looks and styles that will appeal to all sorts of potential buyers. By helping people use their imaginations, you can help them feel as if the house you are selling, could easily be their new home. Believe it or not, most people have a hard time envision the changes in their head so showing them with a cool app is very helpful. With apps like HelloSign and DocuSign, just to name a few, buyers and sellers are able to sign and return documents quickly via electronic signature. This saves everyone a lot of time and eliminates a lot of the hassle of scheduling meetings or relying on the USPS, FedEx or UPS. We all want things to go as smoothly and as quickly as possible, and this software can help with the process. These are the top tools that we make sure to utilize in our business, and that’s why they might make sense for you, too. It’s one thing to read about these tools and research them, but it’s an entirely different thing to actually implement them. Taking action is the most important part of selling your house. Hopefully, these tools will help.